That’s what Mama would say about now. 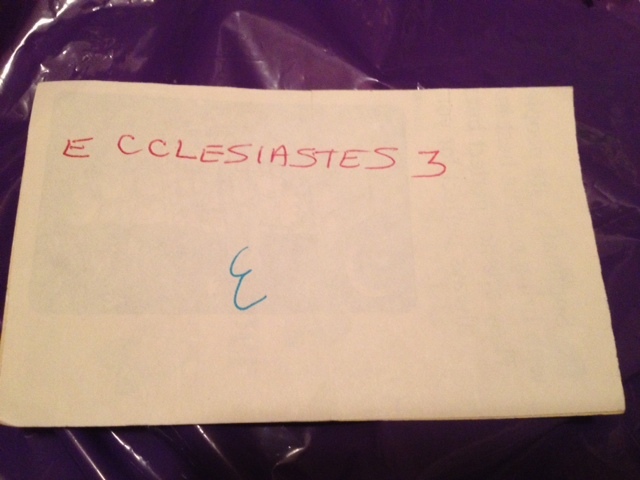 Referring to the verses from Ecclesiastes 3. Mama loved that passage. She even wrote it down on one of her recycled Mary Engelbreit calendar pages as a reminder to remember where I am–what season, what place. The season I have been in this week has been a busy one. Saying goodbye to another family of neighborfriends. This is the life in a military community. Folks move into your neighborhoods, into your hearts, and then they must move on. It’s been a week of endings. The end of our year of dance and gymnastics for our Princess and Cooter. And for me, who has usually been the one making the trek twice a week in my “taxi-mobile” to and from. And for our family who has suffered through eating takeout on Tuesday nights (ha, who am I kidding–I can name at least four of the five who look forward to that night). Yes, it’s been a good year. Rocking the Ninja moves to the theme from Mission Impossible. 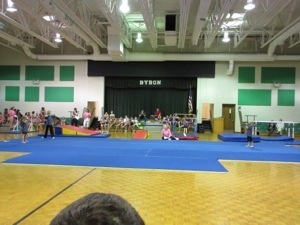 Thursday evening, we attended their gymnastics program. It was fabulous. From listening to children singing along with the song that Princess’ class did their routine to–“The Best Day of My Life”–to watching Cooter and his male counterparts do a ninja-like routine to the theme from Mission Impossible–it was AWESOME. Top it off with folks who know my children and love them anyway showing up to sit on the bleachers and clap and give hugs and high fives after. We giggled watching Princess walk across the gym on her tiptoes (it’s what she does) and nodded together that the song she performed to suits her well. We watched in awe as Cooter did cartwheel after cartwheel. Well. Just full to bustin’, y’all. I can’t even put all that good stuff into words. Except to say. It was good. 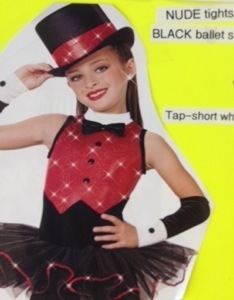 The costume for my girl’s dance recital. Snazzy, right? Even more so with the bowtie! Last night was dress rehearsal for the dance recital. As we got our Princess together–hair, makeup (oh my stars–only light stuff for our girl, I just can’t), and costume, we realized she did not have a bowtie. Her costume was adorable. 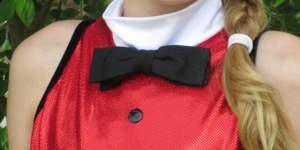 All tux with bowtie look on top with red sparkly fabric–sharp and cute all at the same time. But no bowtie? Sigh. Yeah. Sounds about right. 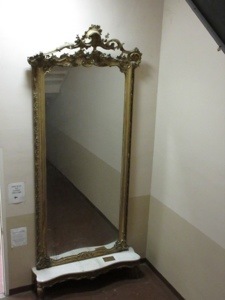 I was convinced it had fallen into the abyss that is our laundry room–where I’d had it hanging waiting for the big day. I spent a lot of time searching and digging to no avail. Finally it was time to leave. Well, it’s dress rehearsal for a reason. I’d figure out something by recital time. Which brings me to the season for today. Today was the season for travelling across town to the craft store to search for black velvet ribbon so I could figure out how to make a bowtie. (I’m sure there’s an instructional video somewhere, right?) When that was a fail, I went to the party store, where “if we had them, they’d be right here.” *points* Well thanks. I’ve enjoyed staring at this spot in your store where you have no bowties. But it’s good to know where they would be, for, you know, the next time we misplace a bowtie. Yes. Thankful for my Fella’s resourcefulness. This bowtie looks great I think. After a major shopping trip to the grocery store (on a Saturday morning, good gravy, why do I do this to myself? ), I headed home to do what came next. Figure out how to “make do.” My Fella came to the rescue, with a black clip-on bowtie from his mess dress uniform. Excellent. It was black and from a distance, it looked no different from the others. Three safety pins and voila! Win. Yes. Hair. Makeup. Check. And we were off. I’ve been up and down the staircase in Porter Auditorium at my alma mater several times the past two days. For those of you who KNOW, I was glad that this one I was only in once. Today was also a season for revisiting my past. Back home to Wesleyan. The recital was on the stage that I walked across so many times, and now my oldest has too. Such a precious thing to me. I helped downstairs and backstage, something I have enjoyed doing each year. I love the excitement in the air, the girls’ stomachs full of butterflies and hair full of hairspray. They giggle and help each other straighten out skirts. They share things forgotten and whisper encouraging words. They talk a bit too loud in the stairwell and tap their shoes when they are supposed to be quiet, but I wouldn’t trade a moment of it. Because I got at least four extra hugs from my Princess today–one from excitement, one just because, one when she heard who was in the audience, and one–“Thank you for being my Mama.” Ahem. Nothing to see here folks–keep on moving. Just a Mama bawling her eyes out. No big. Tonight I am thankful for Team Zoo Crew–who pulled it together and got our littles where they were supposed to be this week, dressed and ready. Well mostly. I am thankful for loving family who step outside their comfort zones and show up, which is one of the most precious things we can ever do for someone. Ever. I give thanks for dance teachers who brush off lost costume pieces, and say, “Don’t stress, if need be, get some black ribbon and tie in a bow and pin it on. No one’s going to notice.” Love that grace-filled woman. I am thankful that she loves the hugs from my girl just about as much as I do. And accepts them every time they are offered, which is often. I love that I have a ninja boy who rocked his performance and, with his one-toothed grin, told me he wants to do gymnastics again next year. Thankful for his teacher who puts up with all those boys every week and says she enjoys it. I’ll take it. Our sweet dance school director encourages her students to let their true colors shine through always. What a powerful song. It’s the big moments like these that I miss my Mama and Daddy even more than usual. I remember with a warm heart the dance recital two years ago. It was the first time I’d seen my Mama light up since my Daddy had died six months before. She was beaming and couldn’t stop talking about all of the performances, but especially those of her grands. And during both the gymnastics program and recital today, our dance studio director incorporated Cyndi Lauper’s “True Colors.” It was played for the last dance today. I’ve never heard this song before the way I did today. Daddy really liked it. I know because he asked me if Cyndi Lauper had gotten an award for it. He only did that with songs he thought were really good. So of course I thought of him. But as I watched the final performance today from backstage, and I noticed the director/teacher guiding her students from off-stage, I saw she was mouthing the words. Her face was lit up with something that had nothing to do with the stage lights. I thought of Daddy and realized whatever she was hearing was what he heard too. And then I heard the words differently myself. So today was also a season of change. Which I don’t do well. But I’m trying. Goodbyes, scheduled big events, heading up and down the massive staircases in Porter Auditorium several times with excited seven- to nine-year olds two days in a row, and missing my parents more than usual–it’s been a whirlwind. But mostly a good one. Yes, this season is a busy one. But I wouldn’t trade it for anything in this world. Love and a wishes for a good season to all. I’ve tried. There have been times, I will admit, when I have let it lead me astray from what I should be doing. But most of the time, I handle it pretty well. And I am thankful for it. We have friends all over the world we are able to keep up with, watch their children grow, and celebrate milestones with because of Facebook. I saw a picture of my writer friend with the “hot off the presses” first copies of her latest book, all the way across the country from me. That was awesome. I keep up with my nephews who are growing up way too fast further up the East Coast. The oldest wants this for this birthday. An “heirloom quality” stuffed dragon for $13000.00. Only it’s not Amazon Prime eligible, so that’s a no. Among other reasons. Ahem. My point is that I found out he wanted this because of Facebook. And my brother and I had lots of laughs over this one. (The reviews alone are worth clicking over and checking it out.) I’m thankful for staying connected. I also am inspired by thoughts shared by Bob Goff, Frederick Buechner, Matthew Paul Turner, Hugh Hollowell, David LaMotte, and Thom Shuman, among many others. If you love beautiful poetry, you should follow Mr. Shuman–what a gift he has. I love the art and thoughts shared by Brian Andreas of StoryPeople. He never fails to make me laugh or cry each day–and sometimes it’s both. There are funny memes and great pictures to share with others on Facebook. I can share my stories and special moments there. Friends share their favorite blog posts and very often, their own, which I look forward to catching up on in the next week or so. *sigh* So much to read, so little time. If it weren’t for Facebook, I might never have heard of ABAN or Love Wins or Love 146 or Trade as One. I wouldn’t be able to keep up with the great things they are doing. Places like Bare Bulb Coffee and The Book Exchange in Marietta let folks know about the special events they have going on through Facebook. Love it. And I love the sharing of ideas among the different communities–ones for homeschool parents and another for spouses of military members and yet another for posting things to sell. You name it, and more than likely there’s a group page on Facebook for it. A wealth of information, right? Oh my land. How adorable is that? It’s almost enough to make me overlook the game requests I get. (I just don’t have time y’all, and besides, I have an addictive personality–I just cannot get started playing one of those games. I really wouldn’t get anything at all done then. So no offense, but yeah. No thank you.) And the folks who vaguebook. You know, mention something but not with specifics, leaving the rest of us to wonder, “Huh?” I won’t say I’ve never done it, but I will apologize for the times I have. I know. I’m sorry. But tonight I did. I decided if I’m going to write about it, I’d best do my research. And well, yeah. There’s four minutes of my life I’ll never get back. Fitted sheets were NOT made to be folded, my friends. Don’t stress yourself out over it. Just wad it up and tuck it in the back of your linen closet or a drawer, or take it and the top sheet and stuff them in the matching pillowcase until you need them. I think I saw that one on Pinterest. Yesterday as the news feeds and Facebook posts proclaimed their great sadness over the death of Maya Angelou, I too was sad. I am sad when anyone in this world loses someone they love–a feeling I understand all too well–but I’ll admit that I was also saddened by something else. I just couldn’t pinpoint exactly what it was. And then this morning David LaMotte, a man whom I had the privilege of meeting a few months ago, shared his thoughts and feelings in a post on his Facebook page. This singer/songwriter/author/man of peace touched on exactly what was breaking my heart. “Shocked into stillness this morning, having just realized that in all of the craziness of the European tour, I did not realize that Vincent Harding died last week. One more giant has left us. I didn’t know Vincent Harding well at all, but… I got to meet him and talk a bit a couple of times at the Wild Goose Festival. This picture is from last year’s WGF. This legendary civil rights hero, theologian, historian and author, who wrote speeches for Martin Luther King, was completely available and interested in Mason [David’s son], asking him questions and engaging. That seems to have been pretty typical of him. Each of these people, and many more unnamed, were people who made daily choices, who worked out their courage muscles one day at a time. They were not a different kind of person. They just made decisions. If we merely applaud, and wonder at how strong they were, then we are completely missing one of the central points that they were trying to make—that it is up to all of us to bring whatever gifts we have to the work of creating and supporting what is good for all of us, and standing in the way of what is oppressive and destructive. All of us. It is up to us whether we see their like again. It is up to us to choose whether we will be spectators or participants. The famous Catholic activist Dorothy Day said “Don’t call us saints. We don’t want to be dismissed that easily.” Let’s honor these heroes by taking some small steps in the direction they pointed us. Though we remember them for their leaps, they all took small steps to begin with, and those steps mattered, and continued to take small steps throughout their lives. They had good days and bad days like all of us, but they kept choosing to live in the kind of hope that doesn’t simply comfort us with pleasant visions, but drives us to take action to actively move toward them. Amen. Please don’t count us out. We too have the chance to do great things. I wrote in a card to one of my favorite graduates in the class of 2014–it is in the making of kind and compassionate choices, one after another, each one, that great things begin. I think that’s how each one of the people mentioned by David LaMotte made a difference in this world. Kindness. Not letting a bump in the road stop them. Continuing onward. Don’t count us out. And please don’t count out my children. The ones I’m doing my best to raise to love folks and make a difference in this world–by being good stewards of all around them, just as my folks taught me. Are we all going to fail at some point? Yes. But it’s in the getting up, wiping off our hands and bruised hearts that we shed light and goodness in the world. It’s in the “keep on keeping on,” as my Daddy would say, despite the bumps and bruises and heartaches, that we change the world for the better. And ourselves. David LaMotte has already said it all, far better than I could have. And I am thankful for that. I think the greatest tribute to the lives of these good people so loved, whom have left this life, is for us all to live as they did, and “actively move forward” toward the “pleasant visions” of peace and love and caring for each other. In other words, for us to do as they did. And DO. Her husband, my Great Uncle, was a man who loved technology. He was a ham radio operator complete with license plates with their call sign on them. He had a computer, the first I’d ever seen. He loved clocks. At one point, before my Great Aunt painted a light shade over the darker wood paneling, they had a wall covered with clocks. I seem to remember he liked working on them. So yes, he loved things that did things. He would love the new smartphones, don’t you think? He would have. I know. I wonder what he would have thought about this though. When we sold the house two weeks ago, this place so full of memories for me, this was still the main phone, hanging on my Aunt’s wall. 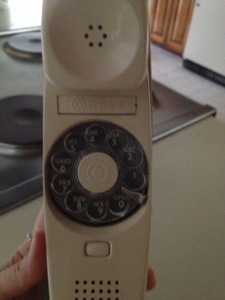 The main phone in my Great Aunt’s house. I’ve had nightmares about misdialing and having to start over. Again. And again. Funny, wonder who has her number now? Wonder if the folks who bought the house will switch out the phone? I wonder if he would have already replaced it. Or just let it go because it didn’t bother my Aunt. Over on the counter was another phone. It looked like a pushbutton from the outside, but when I lifted the phone from the cradle–ah yes, consistency always was a strong suit in our family. 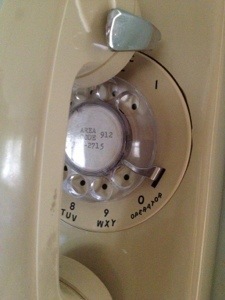 The updated model from the wall rotary dial. When I looked down at the base though, that’s what took my breath away for a moment. Speed dial. And who was on it. Her best friend, my Mama, and her doctor. That’s it. She had as her three and only folks on speed dial–her best friend, my Mama, and her doctor. Why would she need anyone else, right? I don’t have speed dial. I guess I don’t really have to with the smart phone–I can look up a contact and hit the button to call. On the home phone, that would take more time than a little bit to program, and I have my IT person–ahem, my Aub– working on other more important things, so it’s just not going to happen on the home phone either. But I do wonder to myself, as I look at what those three names represented, whom would I program in? My Great Aunt’s faith in those three people–she needed no others. Ten blank spots, and she didn’t need a one of them. Me? I’d probably still be trying to whittle it down. I would stress over hurting folks’ feelings too. Rather than picking out the ones whom I trust most in the world and moving on with my life. No answers tonight, just contemplating. I’ve lost folks who would have made the cut. I still have others who most definitely are on the list. But how many? Who? Whom do I have faith in to answer and be there every. single. time. 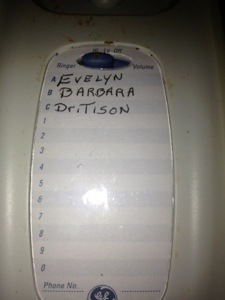 as my Great Aunt did with Miss Evelyn, Mama, and Dr. Tison? Love and wishes for wonderful people to put on your speed dial. If they even make phones with that anymore. It went too quickly for me to get a picture before they all dug in. 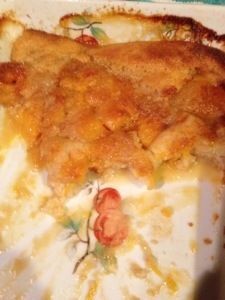 This is the peach cobbler I made today. I know I probably shouldn’t have. My Mama would have gotten up extra early to bake it or not made one at all. And to be honest, I did feel guilty using the oven in the middle of the day. It doesn’t heat the house like the oven we had growing up, but it does warm the kitchen up a bit. I have peaches in the freezer. More than I should have this time of year. It’s peach season again, and even though I don’t eat a peach fresh from the orchard before July 1 (my Daddy taught me that), I have way more bags of peaches in the freezer than I should, with just a little over a month left before I start peeling and slicing and freezing again. So a cobbler it was. Surprised the whole family. The Fella who was off today, Aub who didn’t have to work until later, and the littles who spent much of their day playing outside with friends. Miss Sophie may be the only one who noticed the smell of it baking, and well, poor thing, she was not getting any of it. Cooter was the last one to have a helping of it. He was out when the others had theirs this afternoon. When he came in, I asked him if he wanted some, and he just about fell, tripping over himself to get into the kitchen. He is my Georgia boy. Once a few years ago, I served him the peaches from a can. He took a bite, made a face, and asked me just what on earth THAT was. I’ve never served them since. He’s right. There’s just no comparing those with the fresh. Look at that grin. Is it any wonder I have a hard time saying NO? 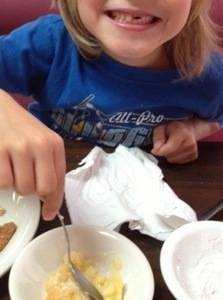 A boy and his peach cobbler…..
He’s something, that one. He makes me laugh everyday, and I am often amazed at the words and thoughts that come from his seven-year old mind. But architecture? Okay, yeah. I see what you’re doing, bud. Trying to go for the education angle as well. My child knows how to get to me. And he knows what he wants in life–he doesn’t mind telling you either. When we were walking into the attorney’s office two weeks ago, I took his hand, told him I might cry a bit, and asked if he would be okay holding my hand. He looked up at me and said, “Mama, I’m just here to go out for lunch. That’s it.” I should have known why he’d chosen to come with me instead of staying home with his sisters when, as we drove through Hawkinsville on our way there, he started scoping out lunch places. “I don’t see a Krystal’s though.” Y’all know that’s his yardstick by which all others are measured, right? Tonight I’m thankful for the joy of surprising my family and for the abundance of peaches in my freezer. I give thanks for many happy memories of sitting around the table with my Mama, Daddy, and siblings putting peaches up every summer. It’s what our people do. And I’m thankful for a funny little fella who loves his Mama’s cooking and loves the desserts at a buffet even more. And will try every way he can think of to convince his Mama to go back. Love and wishes for an unexpected sweet surprise to all. Not since I watched as Alzheimer’s Disease tore away page after page of memories for someone I loved, slowly at first it seemed and then more quickly. She covered well; I’m not sure how many could pinpoint what was going on exactly. She was great at asking questions that you could ask over and over and it not seem very odd. “Seen any good movies lately?” “How’s the weather been back home?” and so on. And so I tuck away precious moments into my memory bank, and sometimes I wrote about them here, in the hopes that they will always be there for me. But I know they may not. Today was just such a day, one that I’d like to always remember. I have snapshots in my mind of sweet moments that I want to keep. Cooter rode off on his bicycle with his Daddy and Miss Sophie for her evening constitutional. I stopped and watched as he rode up the street. And it occurred to me–I never tire of watching him ride his bike. He is so graceful and smooth as his little legs pump the pedals and his hair flies out behind him. And he always smiles the biggest smiles. He LOVES his bicycle. (Has it really already been seven months since he gave up the training wheels?) I nodded as I thought to myself, I could sit and watch him and his joy and movement for hours on end and never lose interest. And then I was thankful that I feel that way. In the busy-ness of life, it is so easy to get distracted. But not when my baby boy’s making the wheels go round and round. That’s good stuff right there. As I mentioned, cleaning up. Straightening up. And so on. I found a basket with a couple of devices and several cords all tangled up. *sigh* That’s about par for the course around here. As I started to untangle by grabbing the larger “outlet plug” end first, I soon became frustrated with how hard it was to push that big end through the knots of cords to disentangle. And then it occurred to me to try the other end first. To take the tiny little end, the one that plugs into a device, and work it through the knots. So much easier. So much quicker. And the gravity pull on the heavier end helped me figure out how to work through the knots. Win! As I disentangled cords in record time, it hit me that this is probably a lesson for life. To work through situations that are such a mess, maybe it would be easier and make more sense if I start with the small bits first. Don’t dive in and tackle the biggest part of the problem first. Take it slow and easy and work through it. And the answer will present itself a little quicker. I don’t know, maybe a stretch, but it was worth pondering over anyway. Tonight I’m thankful for a napless day–and it’s not often you’ll hear me say those words. I had the energy and the drive and the patience to make some things happen around here, interspersed with moments I hope to treasure for a long, long time. Thankful for all of that. It was a day of one thing leading me to another room where I saw something else that needed doing, started on it until it led me to something else. And yet, somehow, a few things got done. And I’m very thankful for that. May your day be filled with moments to treasure and easily untangled “cords.” Love to all.